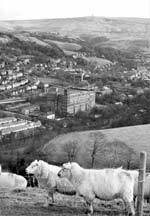 Three years ago a massive redbrick building that had dominated the western approaches to Todmorden town centre for almost a century disappeared under the onslaught of the demolition squads. Mighty Mons Mill - which took three years to complete, from 1907 to 1910 - had, amazingly, ended up only half the size envisaged by architect Abraham Stott, who designed the seven-storey edifice to be a fitting monument to King Cotton. Mons Mill still dominated the area when this evocative photo was taken by Bill Marsden, just months before the demolition gangs moved in. There was opposition to the building right from the start. Called Hare Mill until the name was changed in the First World War (marked by a huge white hare etched into the chimney in glazed brick), even company chairman Jonathan Gledhill is said to have had reservations about building a cotton mill in such a beautiful valley. Among its most notable features was the massive 3,000 horse power Belgian steam engine, boasting two cylinders each one metre in diameter, installed in an engine room of almost cathedral-like appearance. Within four years the mill had been renamed in honour of the famous First World War battle. Mons Mill engine house, a magnificent example of Edwardian architecture and engineering. Mons Mill continued as a major textile producer throughout the boom and bust years of the 30s, 40s and 50s but it couldn't last; cotton production ceased altogether in 1968, when owners Courtalds pulled the plug. The steam engine was scrapped in the 1960s; in 1980 the engine house, with its wonderful mosaic floor, was demolished too, together with the chimney. Following the departure of Volex, the last occupiers, the bulldozers finally moved in and in the summer of 2000, Mons Mill was reduced to rubble in a matter of weeks. There's more on Mons Mill in Issue 5 of Milltown Memories. If this or other stories stirs a memory, we'd be happy to know - send us your memories and comments.